Congrats Rebecca! I just looked up your website and I think that your work is really lovely! I cannot wait to see what you will create for the next round! Keep up the amazing work. Claire. Congratulations on making it to the semi finals! I adore your piece, so I hope you go further in this contest. I loved reading about your process, and especially love your theme. Good luck to you in the next round! I’m not surprised you made it to the top 50 Rebecca – your work is gorgeous! 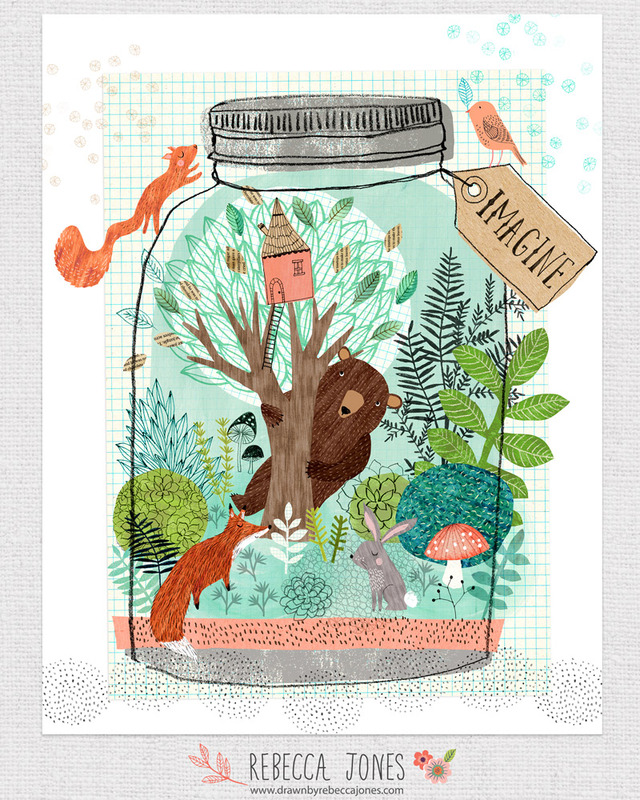 Love your terrarium illustration with all the textures and drawn pieces, and loved hearing about your little man’s interest in them – I can imagine little boys creating pre-historic jungle and dinosaur inspired themes! Your design is amazing -all the wonderful detail and I love the bear and the cute tree house!! Famtastic!!! Huge congratulations Rebecca! I will be cheering you on for the next round as your work is super lovely. Wishing you lots of luck. You were frequently in the MATS reviews, so I am not at all surprised you made it this far! Yay!